Oliver examining the inside of a sculpture to spot signs of casting techniques. Photo by Sam Li. Summer quarter begins today, and we’re ready for a productive and fun summer in the Art + Science Lab! 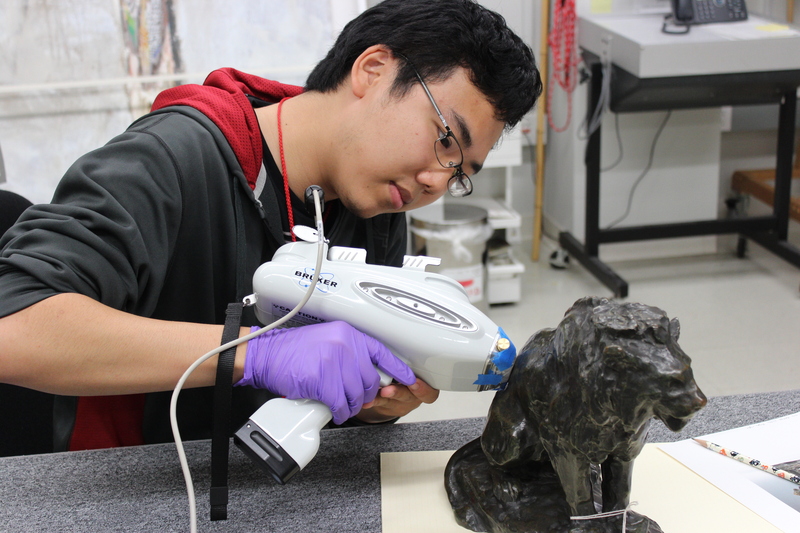 One of our fellows, Oliver Wang, has spent the spring getting ready to study Stanford’s Rodin bronzes with researchers from the NU-ACCESS project at Northwestern University. Our collaborators from Northwestern will be on campus in a few weeks, so look forward to updates on what we learn about the different casting techniques for bronzes made during and after Rodin’s lifetime. For more on x-ray fluorescence, check out our techniques section. We’ll also be introducing the rest of our awesome summer students soon! Working with our new handheld x-ray fluorescence analyzer. Photo by Sam Li.